Renaissance of (in) Kerala, important events/movements/leaders details are given here. 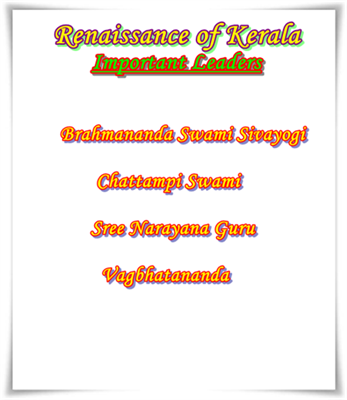 Brahmananda Swami Sivayogi, Chattampi Swami, Sree Narayana Guru, Vagbhatananda, Thycaud Ayya, Ayya Vaikundar, Poikayil Yohannan (Kumara Guru) and Ayyankali are the prominent renaissance leaders who shaped the history of Kerala. Being a state for its uniqueness in geographical position, Kerala had become the centre of attraction of people from around the world. The history of Kerala has hot shaped by the influence of various cultures. Even though, a number of events and people contributed for the social reformation movements in Kerala, it would be worth to note down the most important incidents/ people recorded in the history of the state. 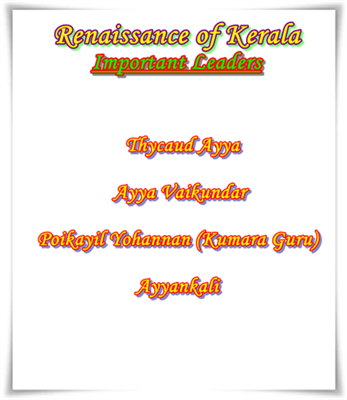 Brahmananda Swami Sivayogi, Chattampi Swami, Sree Narayana Guru, Vagbhatananda, Thycaud Ayya, Ayya Vaikundar, Poikayil Yohannan (Kumara Guru) and Ayyankali are the prominent renaissance leaders who shaped the history of Kerala. Here are the 7 social reformers who put a lot of effort to change the cultural status of the state. Brahmananda Swami Sivayogi: Brahmananda Sivayogi (1852-1929) the founder of the Sidhasramam was a strong advocate in Yoga system of philosophy. He founded the 'Ananda Maha Sabha' in 1918. Sivayogi fought against various social evils and was wished to bring changes in the Marumakkathayam system of inheritance, widow marriage, prohibition of liquor and female education. He laid stress on happiness (ananda) which was essential for the welfare of mankind. He has written more than 15 books including Mokshapradipam and Anandasutram. His personality and teachings truly influenced the social life of Kerala. Chattampi Swami: Sree Vidyadhiraja Parama Bhattaraka Chattampi Swamikal popularly known as Chattampi Swamikal (1853–1924) was a Hindu sage and social reformer who revolted against the existing social order prevailed in the community. Swamikal as a social reformer could rouse the social consciousness of the Nairs and which in turn made them to fight against the social evils such as untouchability, sub-caste barriers and observance of irrational social practices. He worked in close co-operation with Sri Narayana Guru in the common cause of Hindu social and religious revival. Sree Narayana Guru: Sri Narayana Guru (1854–1928 was a Hindu saint, sadhu and social reformer who had made a solid contribution to the social changes in Kerala. He revolted against the Brahmin dominance and campaigned for the alleviation of the rigours of caste. He also campaigned against the observance of practices such as Talikettukalyanam and Tirandukuli. His highly eclectic attitude in religious matters is evidenced by his famous saying "One Caste, one Religion, one God for man". Also being hailed as "the father of Modern Kerala Renaissance", the works of Sri Narayana Guru helped to rouse the Hindus from their age-long siesta and made them to realize their rights. Vagbhatananda: Vagbhatananda Gurudeva(1885-1939) was a social reformer who played a crucial role in the social reform movement in modern Kerala. His magnetic personality and oratorical skill engrossed towards him a large number of supporters. He founded the Atmavidya Sangham, a group of professionals and intellectuals who had a more secular approach to reform. He condemned caste barriers and idol worship and urged his followers to reject such practices. Being a vigorous campaigner against addiction to liquor, his teachings helped to strengthen the base of the nationalist movement mainly in north Kerala. Thycaud Ayya: Thaikkattu Ayyavu Swamikal (1814–1909) was a spiritualist who is considered to be one of the greatest social reformers of Kerala. He was the first to break customs related to caste in Kerala when caste restrictions and untouchability were at its peak. Ayyavu wrote several books on Bhakthi, Jnana and Yoga in Sanskrit, Tamil and Malayalam with Brahmotharakandom, Pazhanidaivam and Ramayanam Pattu prominent among them. His disciples Chattampi Swami, Narayana Guru, Swayam Prakasini Amma, and others followed the teaching of their great teacher. Ayya Vaikundar: Vaikunta Swami (also known as Muthukutti Swami) (1809-1851) was a man of progressive social outlook. Even though he was also called as Mudichoodum Perumal, he had to give up the name as it could only be used by the upper class people during the time. So parents called him Muthukutty. After learning Nalvazhimoodur, Thirukural and the Bible he went for a pilgrimage and meditation in Thiruchentoor. Returned at the age of 24, he called himself as Vaikunda Swami. He tried to alter certain social customs which was prevailing at that time among Nadars. In 1836, he founded an organisation called 'Samatva Samajam' to fight for the redressal of the gripe of the Avarnas. The Samatva Samajam being one of the earliest social organisation, Vaikunda Swamikal become a pioneer social revolutionaries in Kerala. As his popularity increased, the King of Travancore arrested his and tortured. After returning from imprisonment, Vaikundar inspired a group of his devotees to undertake a religious exercise called Thuvayal Thavasu. Poikayil Yohannan (Kumara Guru): Poikayil Yohannan (1878 – 1939), known as Poikayil Appachan to his followers, or Kumara Gurudevan was a Dalit activist, poet, Christian preacher who founded the socio-religious movement Prathyaksha Raksha Daiva Sabha ('God's Church of Visible Salvation'). Born as a bondsman to a Syrian Christian family, he had to follow Christianity and a Christian name, called Johannan. Well literate and versed with Bible, Johannan sought to create a sense of unity among the Christian Dalit communities. Even though he joined the Marthoma church, as he realized that the church treated Dalits as an inferior class, he left the church. In 1909, Johannan left Christianity and formed his own Dalit liberation movement named 'Prathyaksha Raksha Daiva Sabha' (PRDS). Known as Poikayil Appachan or Kumara Gurudevan later, Johannan advocated devout liberation, and sought to empower and unite the Dalits. Poikayil Yohannan bought several acres of land and set up schools and industrial training centers in various places. He even established several government aided schools for Dalit education. Ayyankali: Ayyankali (1866-1941), was a strong leader who worked for the social advancement of Pulayas and other depressed classes. He was influenced by the activities of organisations like the S.N.D.P. Yogam and social reformers like Sri Narayana Guru. He worked among the the Harijans and found for the rights denied to them. He founded the Sadhu Jana Paripalana Yogam in 1907 which aimed at the upliftment of the Harijans. His untiring and selfless efforts gave much progress to the Harijans. Would you like to know name of the people, who fought for freedom of India in Kerala? Just follow this article for find the best freedom fighters and their details. This article will let you know the selfless service done by them.